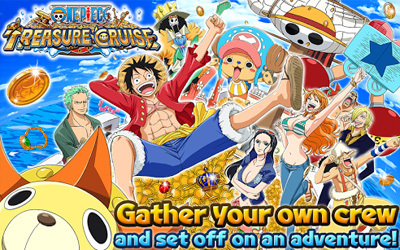 Previous version ONE PIECE TREASURE CRUISE 7.1.0 apk for Android will help you to downgrade or install older app easily. This is one of the best Role Playing apps. Later, you will be playing follow the same storyline with anime. At the beginning of the game, you will be in Fushia Village, Luffy’s hometown. Here you will be told beginning Luffy has elastic ability and his encounter with a famous pirate named Shanks. Shanks saves Luffy from the grip of the sea monster that Shanks had to lose his left hand. In each stage you finish, there is a gift. One of these gifts is a new member in the team that will help resolve obstacles and challenges along the way. Each new member you can have it upgraded to have a high level of strength. When a character has reached the maximum level, you can evolve it to become stronger. In ONE PIECE TREASURE CRUISE for Android, you will find a Gom Gom Fruit. Usually we know this as Gems. With Gom Gom Fruit, you can recruit a strong and specials character to strengthen the team. Relive Your Favorite Moments from the One Piece Storyline! Form a Crew with Your Favorite One Piece Characters! Perform “Tandem” Attacks to Deal Huge Damage! The Character Box can now hold an additional 50 characters for all players. The conditions for unlocking Special Requests have been removed for Requests from Chopper Man. These Requests are now available for all players from the start. The tips displayed on loading screens have been updated. The way the game is structured is brilliant. The stamina system means it’s not the kind of game you have to play every minute of every day and the upgrading of characters keeps the game fresh and stops the gameplay from getting repetitive.